The game few asked for. But we delivered anyway. Limpeh Says is meticulously designed and crafted with precision, care, and love. The brain-child of creator Tan Yong Heng, was initially developed as a school project for a 2-credit module, much to the dismay of three people. Tan, then 20, set out to do the unthinkable. It’s not about the size of the card. It’s how you use it. Try our game. Buy a set on Shopee here! Limpeh Says plays similarly to Cards Against Humanity. Although meant for aged 18 and above, the gameplay mechanics are that of 12 and below. It has 550 unique cards, 90 Red, and 460 white. Red cards are questions to prompt other players, while white cards are answers. Play the cards according to the Limpeh’s humour. We value your feedback. It is very important to us. Here at Limpeh Says, we strive to bring the best personal party gaming experience to the world through our innovative hardware. We are committed to improve the well-being of Singaporeans. Limpeh Says’ emphasis on multi-racialism and equality brought peace, progress and prosperity to Singapore within a span of fifty years. Limpeh Says is distributed under a Creative Commons BY-NC-SA 2.0 license. (I.e. to say you can use for free, but cannot anyhow sell without permission. Understand, Gennermen?) 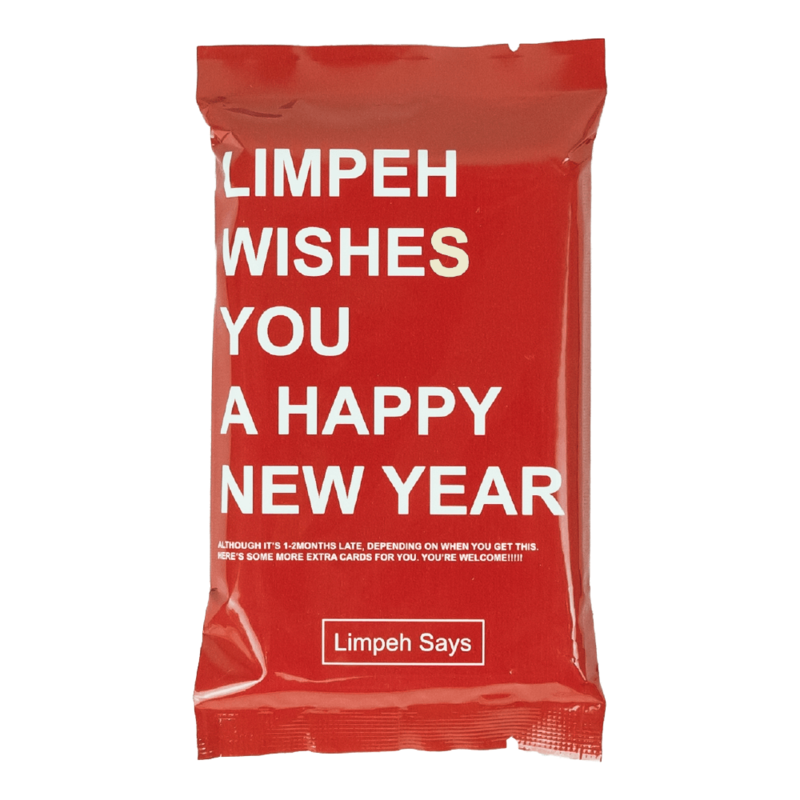 “Limpeh Says” and the Limpeh Says logos are trademarks of Tan Yong Heng and Grouch Potato Games. Designed by Limpeh. Remember, free will is an illusion.